I have alway been a little scared of Rhiannon Lassiter. I don’t know why. I met her briefly five years ago and she was really lovely, so I know I have no cause for worry. But how can you have a Halloween author profile without a good scare? Although I’d started novels, the first one I finished was the first one accepted. My first novel was accepted for publication while I was at university. Prior to that I’d submitted a draft proposal to a couple of publishing companies who’d said they were interested in reading more from me but that they didn’t think the idea I’d submitted (a fantasy story) was quite original enough. Then I started work on a science fiction novel, submitted a draft – and it was it accepted. I know this is atypical and I feel fortunate to have got such a positive response so early on in my career. I get ideas wherever I am. But I think some of my best have come on holiday and out of my usual environment. A house in the Lake District inspired Bad Blood. 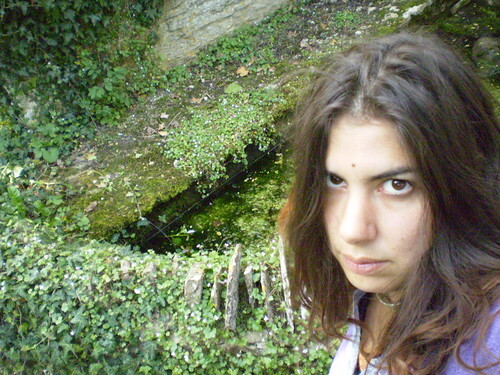 I began Waking Dream in Italy. Ghost of a Chance came from a weekend visit to a stately home. I’ve sometimes thought about it because I like coming up with names for my theoretical other identity but I am too jealous of my ideas to assign them to another name. I want them all associated with me! An experience I couldn’t identify with. If I couldn’t imagine myself into that identity or situation I couldn’t write about it. I was sent a photograph by a film producer of a teenage actress holding one of my books who was interested in playing the lead if it’s ever made into a film. I don’t think I can say who it was, though – sorry! When I wrote Hex I wanted to be Raven. Since then I’ve put parts of myself into all of my characters so most of them are people who are like me or who I’d like to be. If I had to choose one it would be Poppy from Waking Dream because she’s a witch in a dream landscape. I’d like it to happen. Although I know films don’t stick religiously to the written text, I’d like to see my characters brought to life. There’s been some film interest in Hex and it’s exciting to imagine that becoming a film. Because it’s science fiction, it’s the only way I’d get to see some of my ideas made real. I’m good at computer games. I don’t find that odd but sometimes teenagers I meet are amazed that I play GTA or SSX. I don’t seem to have one, sorry. I checked and Lene Kaaberbole is Danish and Tove Jansson is from Finland. I keep a Billy in the attic which holds a heap of detective novels. 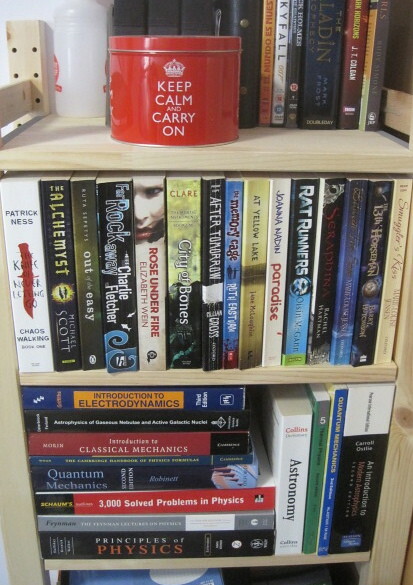 The rest of my books are in built-in shelving and a few overflow bookcases. They are arranged by genre (picture books, junior, adult, SF and fantasy, graphic novels, non-fiction, myths and legends, cookery etc). 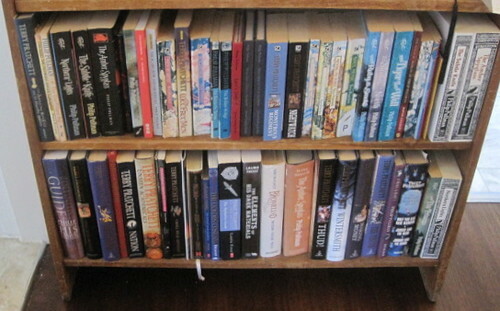 They are all shelved alphabetically except the cookery books and non-fiction. It depends why they were reluctant but either The Recruit (the first of Robert Muchamore’s Cherub series) or Ordinary Jack (the first Bagthorpe book) by Helen Cresswell. But if I’m reading, I’m thinking – and my thinking tends to come in the form of making up stories. Even if I never wrote anything more via pen, pencil or keyboard I’d still be writing in my head. I have found the perfect little book for your Halloween reading. It’s Rhiannon Lassiter’s Little Witches Bewitched, a collection of five short stories about two little witches. While it’s all very well to get into the spirit of things this time of year, I have to admit to preferring sweet spooky, to terribly frighteningly spooky. And that’s what you get in this brand new ebook, which celebrates Halloween tomorrow by being available for a mere £1.53. I’m telling you about it today, because I want your trigger fingers to be ready to go. Dulcie is 11 and she wants to be a witch. When out trick-or-treating she meets Verity who is 12 and while she didn’t exactly want to be a witch to begin with – especially not one wearing pirate’s boots from the dressing-up box – she soon changes her mind. Through a slight ‘mishap’ the two girls actually become real witches, albeit only little witches. This is a thoroughly enjoyable collection of stories, and since I don’t want to spoil it for you, I will say no more. 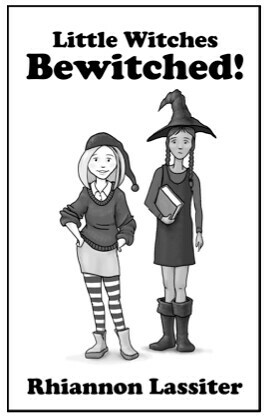 Except, you meet some fun characters, and these are two quick-witted witches. Small, but brave. As a follow-up to last week’s post on how much authors earn, I give you pies. The very kind and extremely hardworking Anne Rooney (who should be in the over £75K category, but probably isn’t) couldn’t settle until she’d made me some pies. And then she sent them over. Having studied Anne’s multi-coloured circles and pondered, I believe I need to share all of them with you. There is something starkly interesting about these coloured slices on how well people feel they do. Are children’s books mostly written by women because junior citizens are more ‘women’s work’? Or is it that the low pay scale makes it a job for women? But then, why are so many the main earner in their household? They have certainly been at it for quite some time. What makes them do it? Writing (a whole book) seems like hard work, so how come writers do it, as well as holding down another job? There is no mention of those other tasks, like childcare or ironing, which presumably comes on top of the two or more paid jobs. We have a lot to be grateful for. That so many are not contemplating giving up, and that there are so many partners propping up the world of children’s books. 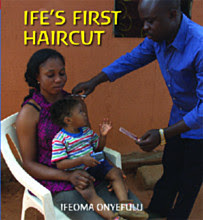 Ifeoma Onyefulu has written two picture books (illustrated with photographs) about that special first haircut, and about going to the doctor for the first time. Vicky Goes to the Doctor shows poor Vicky feeling off-colour. She won’t eat her dinner or play with her friends, so her mother takes her to see the doctor. It’s very low-key, but it does show a nervous child what it could be like, which is often what you need. In Ife’s First Haircut Ife’s sister complains that his hair is too long. Her father explains that Ife will indeed have his hair cut, but first they need to shop and cook for the party that accompanies the occasion. Two sweet, everyday kind of books, which seem all the more exotic – to me – for being set in Nigeria. 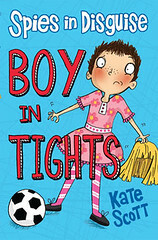 Boy in Tights is not exactly about how real spies behave. At least I hope not. Joe suddenly finds that his ultra-boring and cautious parents are spies. With only minutes to spare they have to flee their home and set off on high speed car chases to shake off their pursuers. As if that’s not unreal enough, once they get to their new home Joe discovers he will have to live as Josie and wear pink dresses and other awful things that his father has bought for him. What was the mother thinking? She should have overseen her son’s makeover into a girl. There is nothing so strange as bad taste crossover dressing. It’s really quite funny the discoveries Joe, pardon, Josie, makes once he’s wearing those ghastly tights. Girls are different! They behave in an alien fashion. They talk instead of punching each other. They go to the toilet together. The girls in his class even invite him to join them in playing. But it’s not just the parents that are weird. Joe-sie finds a mystery on his new doorstep, so to speak, and with the help of a new friend – a girl! – he embarks on the mis-use of his parents’ spy toys. Can he do it before his own secrets are discovered, or before that blond wig of his falls off? This is really silly. But fun in the ‘girls are different from boys’ sense. And these days everyone plays football. 30 seconds from home (that’s a lot less than 24 hours from Tulsa) the police caught up with us. It was nothing too serious. Son’s 21st birthday went almost un-noticed. He spent it having lunch with the Retired Children’s Librarian. As you will have seen from yesterday’s post we spent his sister’s 21st with him (rather than with the birthday girl herself), so I suppose that almost makes up for it? One day late, we drove across Fife to eat too much cake. 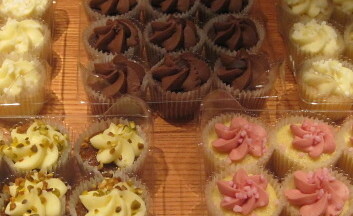 In fact, it was such an excessively cakey day I don’t think I can let on how much we ate. Anyway, we began by donating our ancient telescope to Daughter’s place of learning, in what can only be described as our version of passing the parcel. The telescope was never un-wanted. Just that little bit too cumbersome. A former toy of the Resident IT Consultant’s grandfather and older siblings, it has been passed back and forth between family members. The Grandmother and I waited in the Physics department while the donating was being carried out (it was raining, which feels so wrong for Fife). Daughter might have felt we were a slight embarrassment – even though we had come to celebrate with her – but I pointed out that the only Physics graduate present was the Grandmother. Actually. While Daughter toasted, the Resident IT Consultant put the finishing touches to her Ivar, which is much smaller than Son’s and is not a stack of wooden wine cases after all. Post-cake I read Dragon Loves Penguin to Daughter, despite the fact that she knows how to read. In return she foisted a bag full of books on me to take home. I can understand that. Her Ivar really has very little room left. Without feeling all that hungry we repaired to our usual eating place, meeting up with Son and Dodo as well as the two AstroSoc dignitaries that the Resident IT Consultant wanted to grill (albeit not for food purposes). We ate some more, and Son ordered all the extra three for twos on the menu. Or so it seemed. 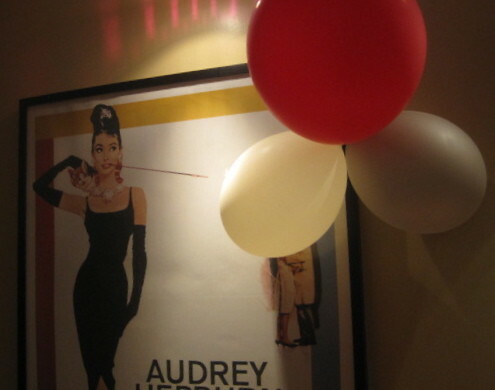 When the time came for the film, they all obeyed as Son announced – loudly – that they should toddle off towards the auditorium, but still they wanted no cake. Or crisps. So here we are, still un-arrested. Cupcake anyone? 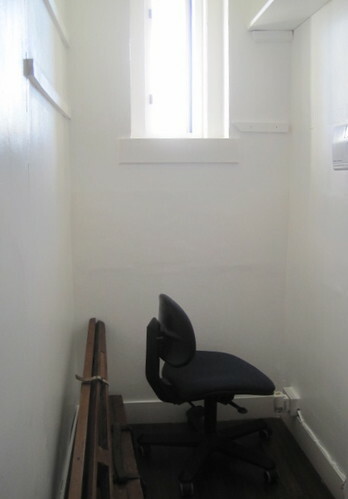 Do you remember my desk in the wardrobe? Now it seems as if the next generation is destined to work in another ex-wardrobe. The new flat Son and Dodo bought is nice but small. As well as the bare necessities it has – or had – a walk-in wardrobe. But this is no more, after Son demolished its wardrobeness and painted it to match the adjoining hall. The Resident IT Consultant and I brought a car load of books and Ivar shelves, a desk-chair and a makeshift desktop to use as, well, as a desktop. In the ex-wardrobe. It looks a bit cell-like, and if you feel that the old telescope is surplus to requirements (for a small office), then you are quite right. It is going to the observatory – obviously – in St Andrews, but had to temporarily exit the car while this transported rubbish to the tip, to avoid being accidentally disposed of. Along with the wardrobe office the new home also came with a shed. The shed came with a lot of unwanted stuff, some of which went straight to the tip and some to Oxfam. By special good fortune we had an Oxfam book specialist with us, and we put her to work on sorting the books from the shed. 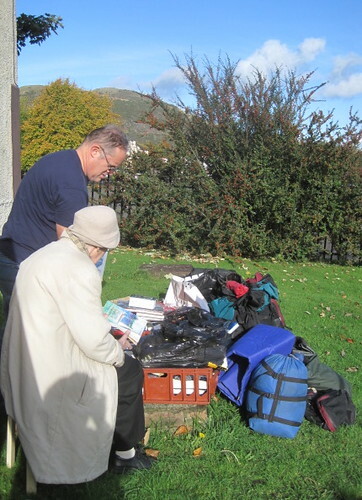 Her being of a Grandmotherly sort of age, we carried a stool out for her to sit on in the autumn sunshine. Towards the end of the day Son got his new tools out and attached legs to the desktop. Then he had to take two of them off again in order to get the ‘desk’ into the wardrobe. Then put them back on, after which Dodo had to crawl in under the desk to adjust the height. 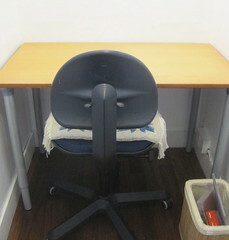 But by the time we left, there was a fledgling office waiting to be worked in! Not bad for a day that started with toast.